An esophageal stricture is a narrowing of the esophagus. It is commonly caused by scarring of the esophagus that may occur as a result of stomach acid reflux that causes heartburn. When a portion of your esophagus narrows, you often have trouble swallowing or it feels like food is stuck in your chest region, causing pain or discomfort. However, esophageal strictures can also be caused by thin layers of excess tissue, cancer of the esophagus, scarring from radiation treatment, or a motility disorder (the way the esophagus moves). 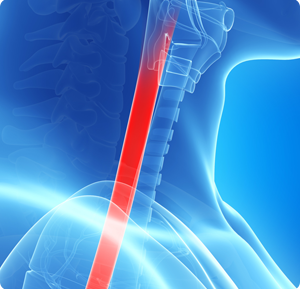 Whatever the cause, esophageal strictures can be treated with dilation, a procedure in which your doctor stretches the narrowed area of your esophagus. You will most likely be sedated for esophageal dilation, which is done through an upper endoscopy. During the procedure, your doctor will pass a long, thin tube with a balloon at the tip into the esophagus and inflate the balloon to stretch (dilate) your esophagus. Once the esophageal dilation is completed, you will remain at our facility for up to two hours while the sedative wears off. After your doctor checks to make sure you are not having any complications, you will be free to go home and resume your normal activities. An estimated 30 percent of people experience an esophageal stricture again within the first year after treatment. If the condition recurs, you will likely need to have your esophagus dilated again. If you are having difficulty swallowing or exhibit any of the symptoms associated with esophageal strictures, the GI doctors at North Shore Gastroenterology in Westlake and Brooklyn, Ohio can help provide relief. Call us at (440) 808-1212 to schedule a consultation or use our convenient online appointment request form.